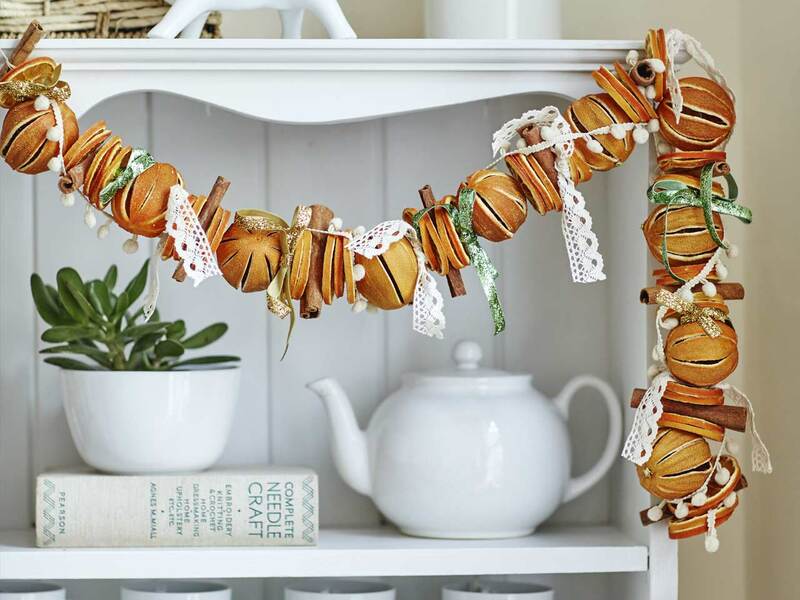 This dried orange Christmas garland makes a lovely Christmas decoration. 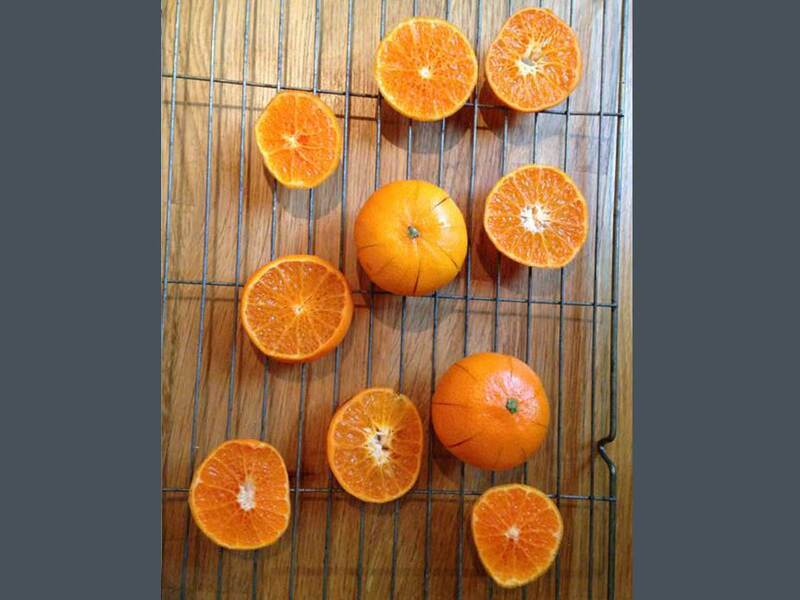 Click the arrows above for a step-by-step guide to drying oranges. While the oven is preheating to its lowest setting, cut the oranges into slices 0.5-1cm thick. 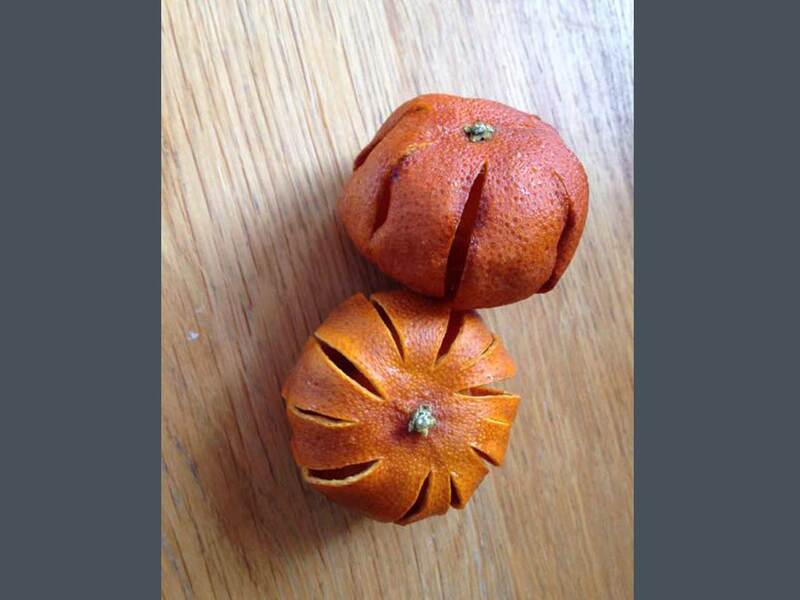 Cut around 7 slashes through the sides of each satsuma or clementine, but be careful not to remove any of the peel. 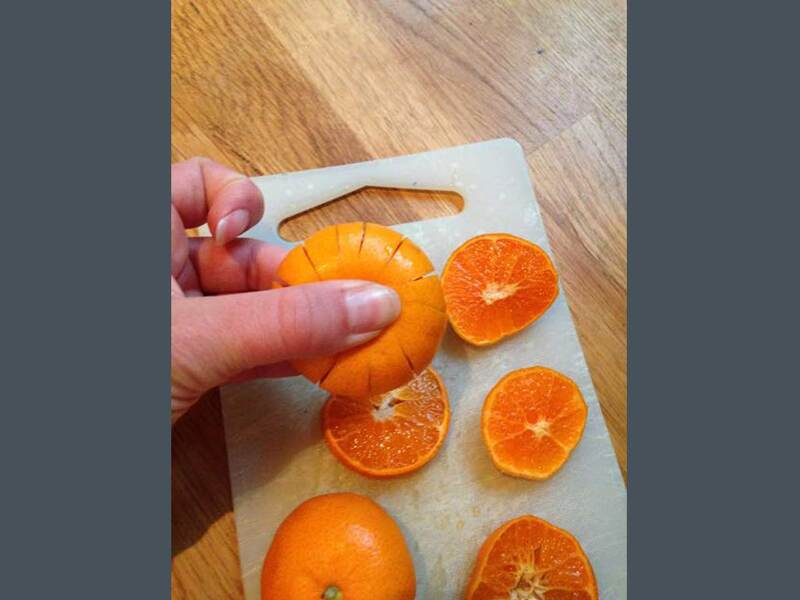 You need to leave the top and bottom intact to hold the fruit together. Place all the sliced and slashed fruit onto a tea-towel and pat out as much juice as possible. Place all the fruit directly onto a wire rack and pop in the oven to dry out. 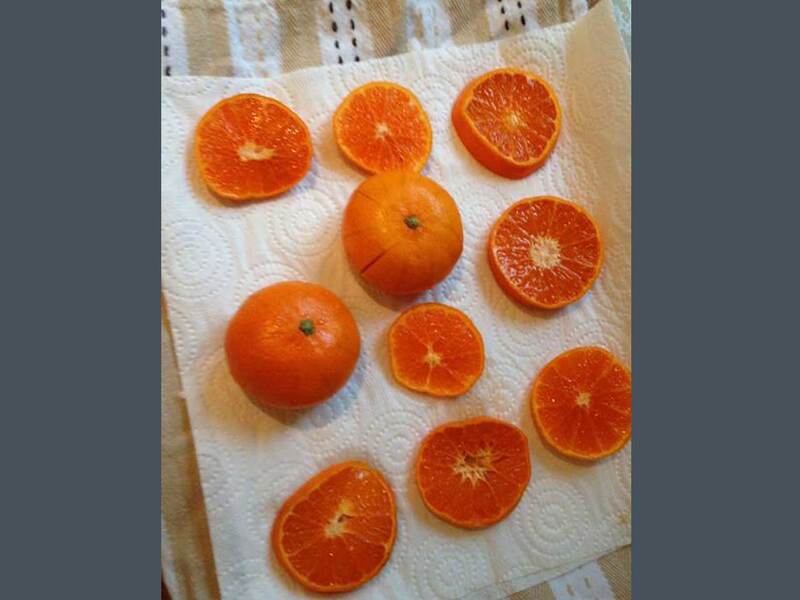 This will take 3-4 hours for the slices and overnight for the whole clementines. Turn the fruit over every few hours, if you can. You might find they are still a little sticky once they’re dried, but that’s OK - they’re still fine to use. These are now ready to be threaded onto the garland. First you need to dry out your oranges. It’s a lovely way to spend an afternoon in the run up to Christmas, as it makes your home smell amazing! Opt for fruit that isn't too juicy as the juicier the fruit, the longer the drying out time. 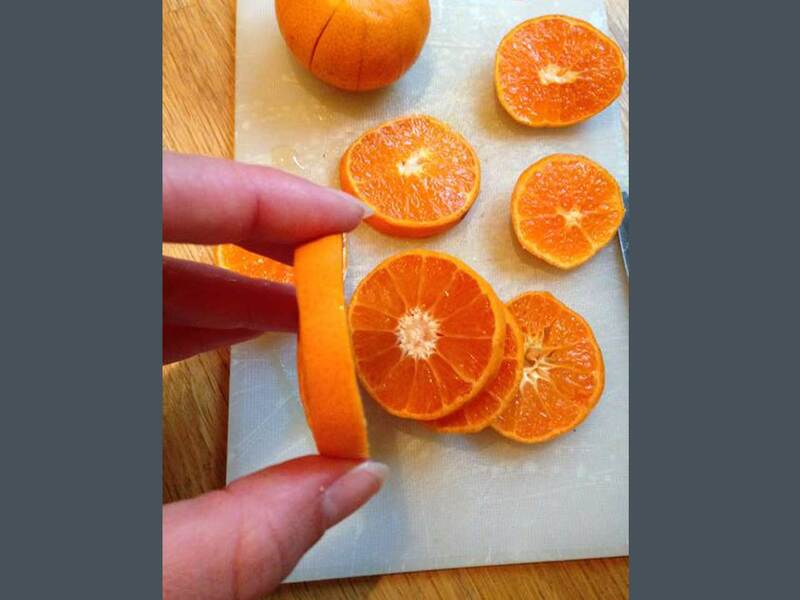 2) Slice your oranges into slices of 0.5 - 1cm thick, cutting around the orange so that your first slice has the stem in the centre. 3) Cut around 7 slashes through the sides of each clementine from top to bottom, right through to the flesh - but being careful not to remove any of the peel. You need to leave the very top and very bottom intact to hold the fruit together. 4) Place all the sliced and slashed fruit onto a tea-towel and pat out as much juice as possible. 5) Place all the fruit directly onto a wire rack and pop in the oven to dry out. Drying time will depend on your oven and the thickness of the fruit, but it should be around 3-4 hours for the slices and overnight for the whole clementines (sometimes up to 15 hours if the fruit are larger). Turn the fruit over every few hours if you can, to prevent sticking. 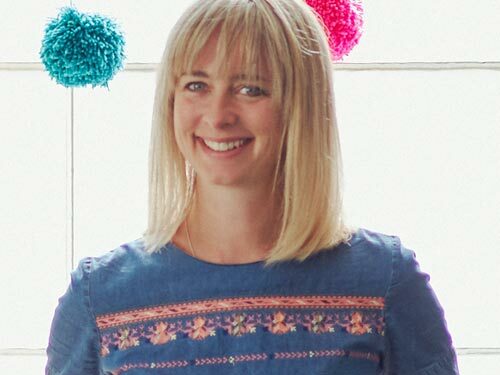 And you can finish them off by laying them on top of a tea-towel on a radiator if you like. 6) You might find they are still a little sticky once they’re dried, but that’s OK - they’re still fine to use. 1) Thread your needle with a length of string or thread. My garland was 1 metre in length, so I used around 1.25m of thread. 2) Knot the thread to make a loop at one end (you can use this loop to attach the garland to the wall or a hook if desired). 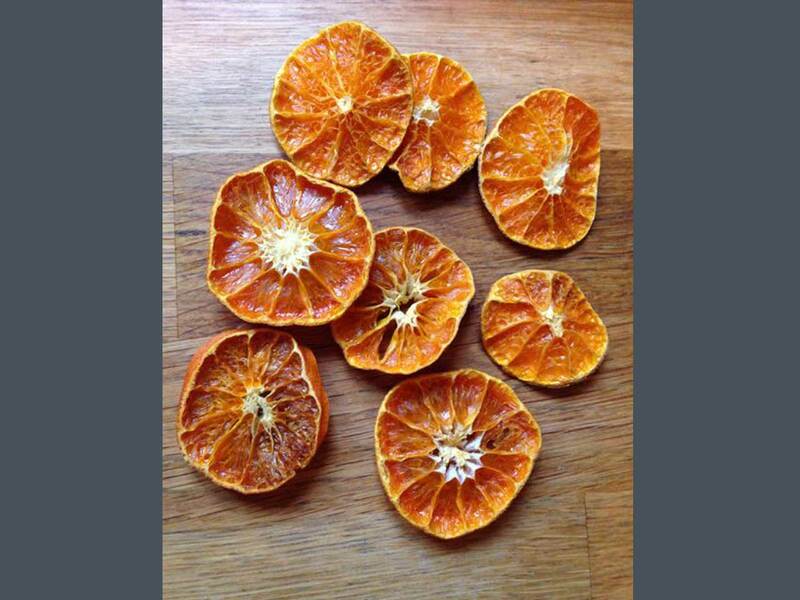 3) Now start threading on your orange slices, clementines and cinnamon sticks. You have 2 choices with your cinnamon sticks: you can either tie them onto your garland using your thread, or you can make a hole in the centre of them using your bradawl or drill. I found that some of the sticks split, so often it was easier just to tie them on by hand. 4) Make sure your garland has some room for movement - you don’t want the items to be threaded on too tightly. 5) When you’re happy with the length, tie another loop at the other end. 6) Now decorate with ribbon, lace and whatever other trimmings you have. I wound one long piece of glitter ribbon along the whole garland, and cut smaller pieces of lace to tie around the thread at intervals along the garland. 7) Now hang for everyone to admire! Fruit not drying out? 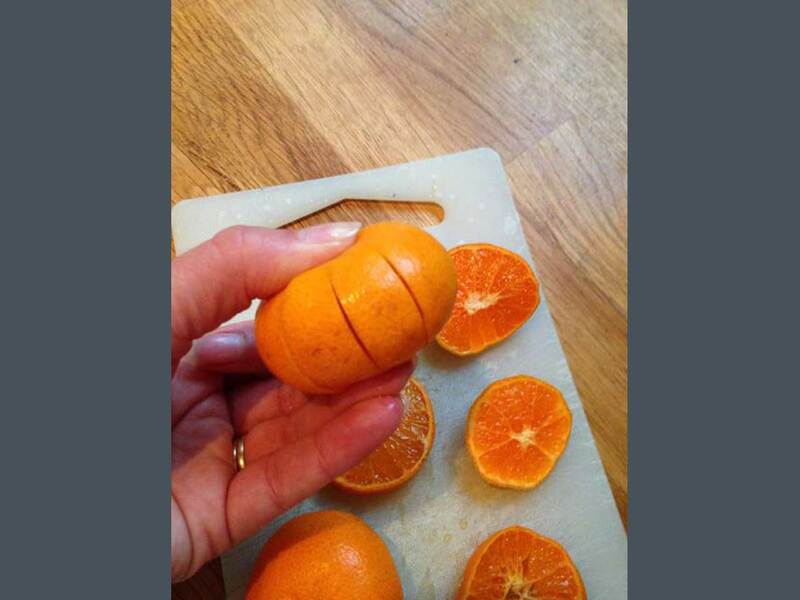 It might be that your oranges are too juicy. If there is any moisture left in them when they come out of the oven lay them on a tablecloth on top of a radiator to finish off. When storing your dried orange Christmas garland for next year, it’s best to store it in a paper bag in a dry place so that the fruit stays nice and dry.